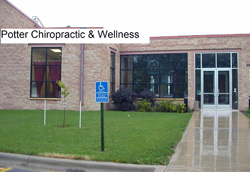 We’ve been delivering quality chiropractic care to the Faribault community since 2004. “I have spent 10 years training how to serve this community as a doctor of chiropractic and have received extensive training in the diagnosis and treatment of spinal health and fitness.” proclaims Dr. Potter. Dr. Steve Potter is a 1990 graduate from Bethlehem Academy and was an all conference wrestler for Faribault High School. After completing highschool he attended Marquette University graduating with a B.A. in Psychology and then went on to Northwestern Health Sciences University earning a Doctor of Chiropractic degree. Dr. Potter is licensed to practice in Minnesota and California. Dr. Potter interned at Woodwinds Hospital in Woodbury, MN and in Sacramento, CA. Sound interesting? Please contact our Faribault office to make an appointment.